And only a couple of weeks left until New Horizons get a better view of Pluto than the Hubble Space Telescope! This article is one of many that came out about it, and includes a nice video showing a simulation of Nix tumbling chaotically over the course of several orbits. Previously only one chaotically rotating moon was known, Saturn's Hyperion, but now it looks like this might be a relatively common occurrence in the universe. Space Engine will probably need to account for this procedurally at some point. I imagine a simple way to approach it might be to do a simple calculation of tidal influences to determine whether the moon should be flagged as "chaotic", and then if it is chaotic the motion can probably be faked reasonably well by just adding in a sufficiently squiggly wave function to the moon's orientation over time. That way one can still arbitrarily advance and rewind time in a consistent way and it'll look like the moon is tumbling around "unpredictably". but now it looks like this might be a relatively common occurrence in the universe. I have another related suggestion: Adding tumbling asteroids. If this exotic spin parameters could be added to Space Engine it would be spectacular!! Latest Pluto/Charon movie. We're getting so close! Just over a month to go. I'd rather them not make visuals like this. Let it remain mysterious until we get the real imagery. Added: Speaking of real imagery, we're now getting them in color. Taken with a different instrument and resolution is lower, but things are improving pretty quickly now. 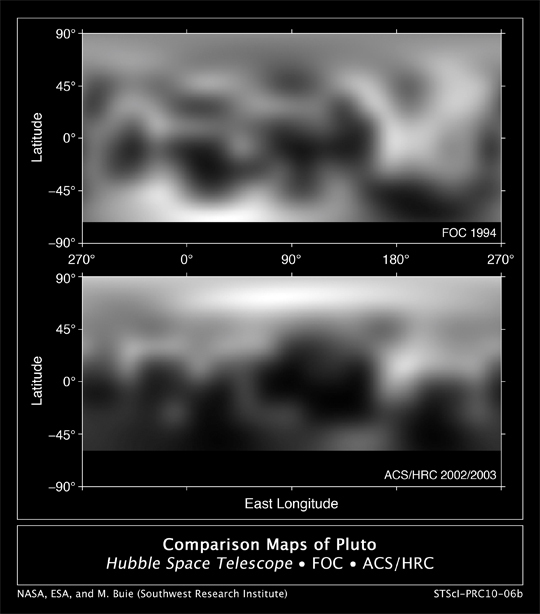 The people at the Planetary Society are making better maps and images of pluto that what is publicly released by the new horizons team at their web page. They are taking the raw data (avaible in the page of the new horizons team) and stacking them together with a bit of deconvolution and some tweaks. Today a new composition has been made by Björn Jonsson. The best pluto you can see right now!!! Is that planetshine from Charon on Pluto's right side limb, or just a darker surface feature, on that second to last new image? I don't think we can see Pluto/Charon shine on each other, since New Horizon still see a nearly full phase. It will be interesting to see the surface features, but I'm not sure it's worth the effort to do this image processing knowing that better images are just days away. Unless as an exercise to have the work judged by these images. This is a simulation of what kind of images we are going to receive in the next weeks before the flyby. A new world is going to be explored!!! So close, just two weeks left! It looks like Pluto has a huge crater on the rim there, but I suspect it's rather a landscape feature exaggerated by image processing.